This is the most common tuning but it is not the only way to tune a guitar. Since each string can be tuned to any note, there are a large number of possible (alternate) tunings. Let’s look at one of the most common: Drop D.
As you can see the only change is the 6th string, which has been lowered to a D note. You can tune your guitar to Drop D tuning by using an electronic tuner. If you have a chromatic tuner you simply tune to a D note. If you have a guitar tuner, the 4th string D note may or may not be able to recognize the 6th string D note. If your tuner has a “Bass” setting, this should work using the bass D note (2nd string on the bass.) Or if your tuner has a flat button, you can set it to two flats (bb) and the D note should register as a 6th string E (bb). Another way to tune to Drop D is to do it by ear. Begin by picking the 4th string open, which is a D note. Let that D note ring and pick the 6th string and start tuning it down until it sounds like the 4th string D note. The 6th string D note will be one octave lower, but you should be able to tell when they are in tune with each other. The notes will not "beat" against each other but will sound like one note. Once you have tuned the 6th string down to D you are in Drop D tuning and ready to try some new fingerings. Tuning the sixth string down to D gives your guitar a deeper, or heavier, sound when you use the 6th string in a chord. It also allows you to play power chords with a single finger. Let’s look at G power chord in standard and Drop D tunings. The first measure is the two and three finger version of the G5 chord in standard tuning. The second measure is the two and three finger version of the G5 chord in Drop D tuning. Because the 6th string is now tuned to a D note — which is one whole step or two frets lower than Standard tuning — when you play a chord in Drop D you need to play the 6th string notes one whole step or two frets higher than in Standard tuning. So the 3rd fret G note in standard tuning becomes a 5th fret G note in Drop D tuning. Since the notes are all on the 5th fret in Drop D you can play the chord by barring one finger across the 6th and 5th strings, or the 6th, 5th, and 4th strings. You need to remember that power chords are two frets higher in Drop D than Standard tuning. 2 finger Power Chords in Drop D tuning. 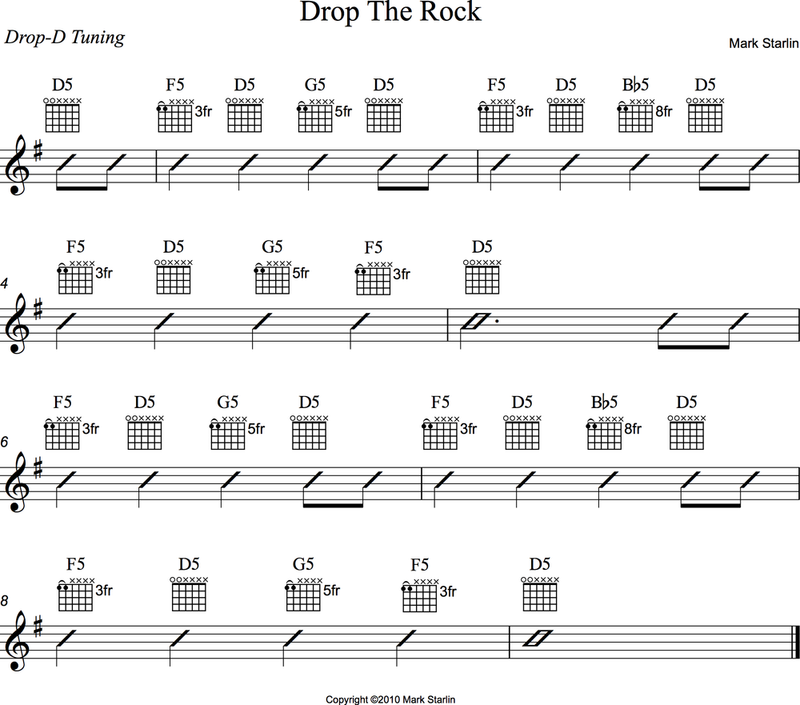 Try this simple power chord rock song in Drop D.
Now try some quick chord changes that would be difficult in standard tuning, but are fairly easy in Drop D.
This lessons was adapted from my method book: Starlin Guitar Method Book 2.